The Christmas Doctor, Book Two details his experiences in Chicago and Oak Park and shows the powerful influence these experiences had on his later life. Filled with the danger and heartache of a country medical practice, the book also captures the refreshing humor of the relationship of physician with patient. John Weber worked his way through medical school in Chicago by hauling freight each evening at the LaSalle Street Railroad Station, finally graduating from Loyola University in 1917. He then interned at Oak Park Hospital, which was administered by an order of Catholic nuns. One wonderful nun, Sister Joan, befriended the young Dr. Weber. She encouraged him through this difficult period. He then saved her sister's life by removing a bullet from her head one night during the Christmas season. Both Sister Joan and her sister were immigrants from Ireland. 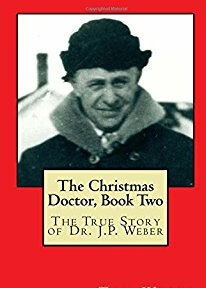 Dr. Weber became a courageous country doctor in Wyoming. While practicing in the small town of Hyattville, he experienced one of his great adventures, delivering a baby on the Lord's Table of a remote church one night after a terrifying automobile journey. He moved to northern Idaho in 1923, where he continued his country medical practice. During January of 1930, Dr. Weber trekked many miles on snowshoes to a mine located deep in the Bitterroot Mountains to save the life of a miner stricken with blood poisoning. The temperature during the journey was fifty degrees below zero. This successful rescue received considerable national publicity. He hiked to a mine in the primitive Chamberlain Basin of Idaho during December of 1933 to attend to a miner who had fallen from a metal capsule which ran on a cable high in the air. Dr. Weber became ensconced on a ledge high above a valley floor while hiking home. Trapped in an apparently hopeless position, his recollection of a promise made to him by Sister Joan during his internship years earlier inspired him to leap to a distant point of safety. What others had to say about the book! Clive Cussler: "A pity men like him aren't around anymore. He was a giant in his time." Russell Baker: "It makes us remember a time when the doctor was a truly heroic figure." Hugh Sidey: "His kind made this country great." Judy Collins: "Your writing is evocative of my own love of the West." Margaret Chase Smith: "It is certainly something that should be read by everyone." Julie Harris: "What a wonderful doctor. I wish I had known him." Tipper Gore: "Your writing has that special quality that takes a reader to the time, place and mood you describe." Liv Ullmann: "You have a wonderful father to remember. I am very moved." Karl Malden: "A wonderful story!" Patricia Neal: "If I were a man, I would love to play him on the screen." Joan Rivers: "If only there were doctors like him today." Tom Weber was born and raised in Idaho. He received a bachelor's degree in Political Science from Brigham Young University in 1970 and a Juris Doctor degree from the University of Utah in 1973. Through the years he has worked for a number of governmental agencies including the Utah State Insurance Fund and the United States Tariff Commission. While growing up he accompanied his father on many of his house calls. He resides in Salt Lake City. Tom's first book, The Christmas Doctor, was published in 2013. His purpose in writing it was to introduce his father, Dr. J.P. Weber, to the public. The purpose of his second book, The Christmas Doctor, Book Two, is to more fully delineate the first forty-five years of his father's life. The Christmas Doctor has been reviewed in eight publications. Accounts of Dr. Weber's medical practice have been praised by numerous writers including Studs Terkel, Tony Hillerman, Clive Cussler, Loren D. Estleman, Bill Pronzini, Joan Didion, Scott Turow, Pat Conroy, and William Peter Blatty.